Star Wars: Legion invites you to join the unsung battles of the Galactic Civil War as the commander of a unique army filled with troopers, powerful ground or repulsor vehicles, and iconic characters like Darth Vader or Luke Skywalker. While innovative mechanics simulate the fog of war and the chaos of battle, the unpainted, easily assembled miniatures give you a canvas to create the Star Warsarmy you’ve always wanted to lead into battle—whether you fight for the monolithic, oppressive Galactic Empire or the ragtag Rebel Alliance. The Star Wars: Legion – 74-Z Speeder Bike Unit Expansion includes a unit of two 74-Z Speeder Bikes, and all the unit cards and upgrade cards you need to expand your forces with these lightning-fast speeders. This dice pack contains fifteen dice, identical to the dice contained in the Core Set. This expansion pack offers an unpainted General Veers miniature and his three personal command cards, inviting you to bring Veers' personal touch to the Imperial armies that you lead into battle. Supplement your games of Star Wars: Legion with a tool of convenience: extra movement tools and range rulers! This set contains three joined movement tools and one segmented range ruler. 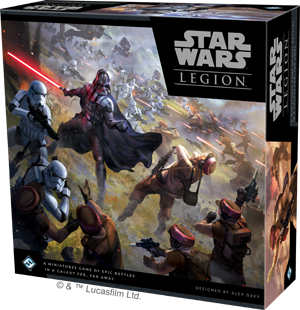 The Star Wars: Legion – Rebel Troopers Unit Expansion features a full unit of seven Rebel Trooper miniatures, identical to the Rebel Troopers included in the Star Wars: Legion Core Set. This expansion also includes the unit card and an assortment of upgrade cards, inviting you to kit out your Rebel Troopers for any battlefield scenario. Within the Snowtroopers Unit Expansion for Star Wars: Legion, you’ll find seven unpainted Snowtrooper miniatures, inviting you to field these troopers as a single unit and combat the Rebellion in even the most hostile and adverse environments. Alongside these Snowtroopers, you’ll find an assortment of upgrade cards, inviting you to kit out your Snowtroopers for whatever you expect to face on the field of battle. In the Star Wars: Legion – Stormtroopers Unit Expansion, you'll find seven Stormtrooper miniatures, identical to the ones included in the Star Wars: Legion Core Set, along with the unit card and upgrade cards that you need to add another unit of Stormtroopers to your army. The Star Wars: Legion – AT-RT Unit Expansion includes a single new AT-RT miniature for you to add to your Rebel army, complete with three different gun attachments that can be attached to your miniature. Along with the AT-RT, you'll find the associated unit card and an assortment of upgrade cards for you to enhance your AT-RT and other units.